See this cute little space dino, floating like it's the most natural thing in the world? Well he was made by hand, with love, in orbit. And you can never have him because he belongs to Earth's luckiest three-year-old boy. Aren't you green with envy? 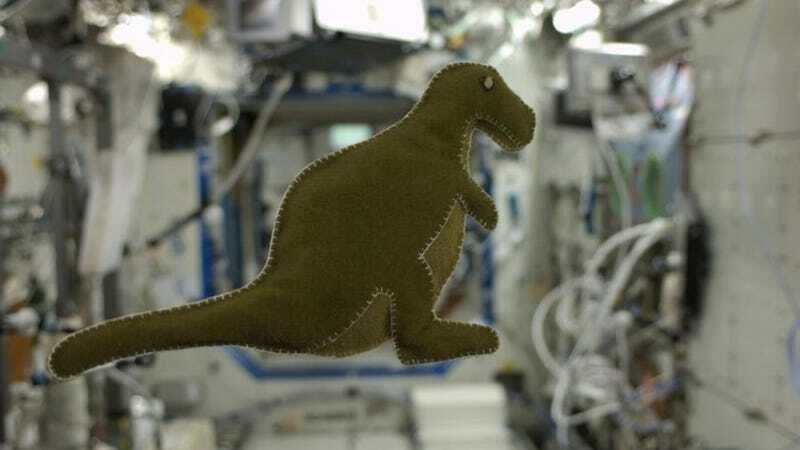 Mr. Saurus here (unofficial name) was made by ISS flight engineer Karen Nyberg—IN SPACE—for her exceedingly lucky son. Mr. Saurus is composed of velco-like fabric that lines Russian food containers and is stuffed with bits of t-shirt. He is also awesome.